Wait a minute. 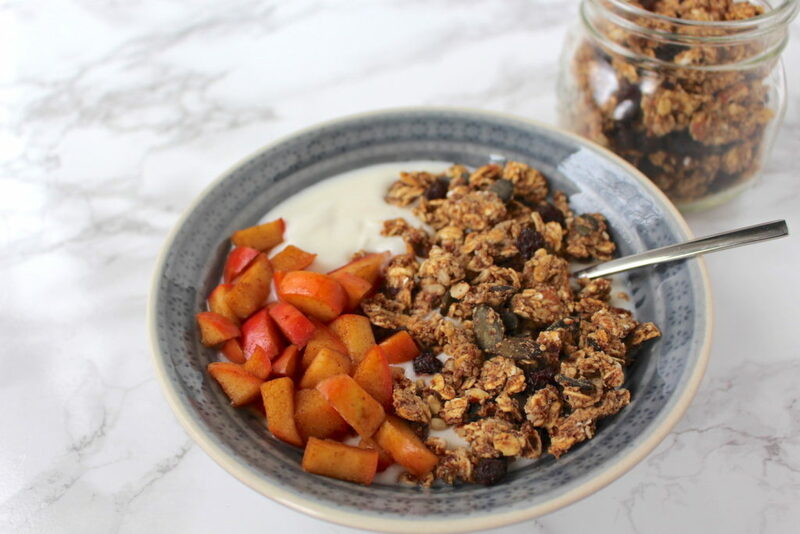 Didn’t I suggest that you wouldn’t need any other recipe for homemade granola besides this one? I did. BUT this is the only recipe you’ll ever need for oil-free and sugar-free granola. By sugar-free I mean without any added sugar like cane sugar or maple syrup. Instead this oil-free granola is date-sweetened. 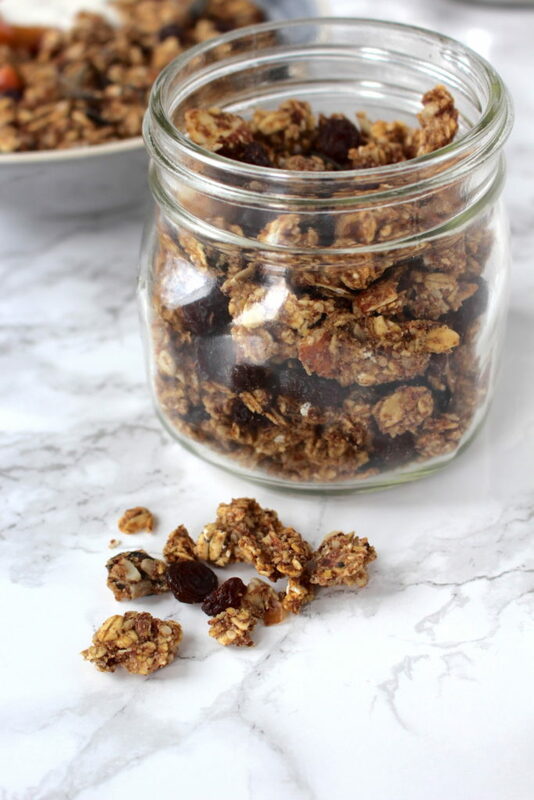 Not only are dates the best ingredient to add mild sweetness, they are also packed with plenty of essential nutrients like potassium and iron, and they make oil unnecessary for this granola recipe. Blended into a puree, dates help hold everything together and make the granola crunchy. You will, however, need a high speed blender or something alike to make date puree. 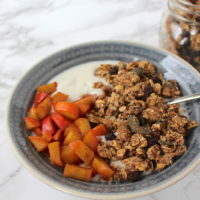 This easy vegan & oil-free granola recipe is very versatile which means you can add other seeds/ nuts or spices that you like or leave them out completely. Sweetened with only dates, this crunchy granola is made without any extra added sugar. Soak dates in water overnight (or a few hours in warm water). Preheat the oven to 250 ° F (120° C) and line a baking sheet with parchment paper. Drain dates and add to blender with about 1/2 cup soaking water and vanilla extract. Blend until pureed. In a big bowl mix together dry ingredients: oats, almond flour, seeds, nuts, spices. Add date puree and (with your hands) combine well until everything is coated. Spread onto the prepared baking sheet and bake for about 1.5 hours, stirring about half way through. I hope you love this recipe – please let me know in the comment section below! 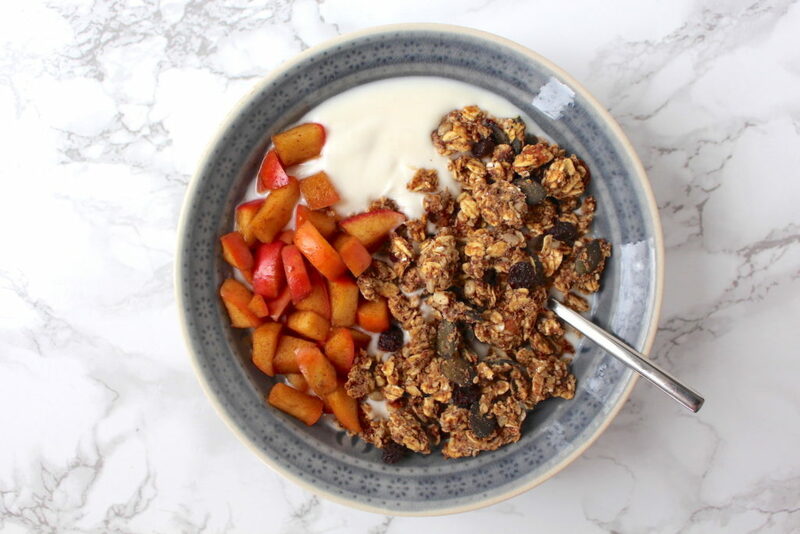 If you make this oil-free granola, make sure to take a photo and share it on my Facebook page or on Instagram, using the hashtag #minamadefood. Oh and don’t forget to tag me (@thisisminamade) so that I can see your creations!